When I was about 9 , I had two goldfish named Chip and Dale. Chip and Dale were your run of the mill goldfish. They were gold. They lived in a bowl. They swam a lot. They were normal in every way except one. They lived far longer than one would expect two goldfish owned by a 9-year-old. It wasn’t until Chip and Dale finally met that large porcelain bowl in the sky that my mother let me in on a secret… Chip and Dale were really Chip and Dale 2.0. It turns out that during a vacation to Mexico, we left the care of our fish to the really nice neighbors who lived upstairs from us. These neighbors had a toddler girl who loved to feed the fish. In fact, she loved to feed them so much that she killed my fish. The father of the fish killer, determined to cover up the crime, braved the worst rain storms of the decade to find two gold fish that resembled Chip and Dale. He didn’t quite succeed, however. A while later I noticed that Chip had a small black dot on his fin that he didn’t have before. My mother explained it away (being a willing accomplice) and I believed her. Fast forward almost 30 years and I find myself in a similar situation. You see, last week Swee’Pea lost her kitty. This kitty was given to her on her first Christmas by her Uncle Ben and Aunt Liz. This kitty has been her favorite ever since. 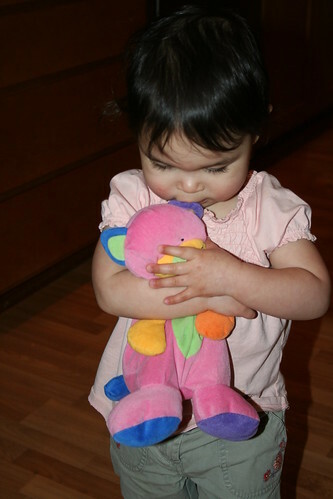 She sleeps with it every night and takes it to daycare every day, tucked lovingly into her backpack. Last week, Kitty left for daycare and never came back. We assumed she’d turn up but she didn’t. We waited for ransom demands but none came. Finally, we decided that kitty wasn’t coming back. Swee’Pea took this news much better than Daddy did. We promised her that we’d let her pick out a new kitty. We even went to Target to look at their pathetic choice of kitties. We went home empty handed. Then I remembered the wonderful internet. The same internet that introduced me to my wife. The same internet that allowed me to have a full compliment of forks and spoons. It could surely help me here. So Sunday night I went on over to eBay and poked around. And then, after numerous searches, I found it. A multi-colored Ty Kitty cat. I chose the “Buy it now” option and sent a nice note to the lady asking her to rush the order as a little girl was missing her kitty. It arrived yesterday. 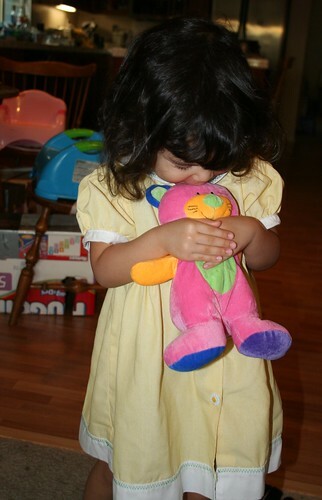 When I presented it to Swee’Pea, telling her that I found her kitty in my car, she could not stop giggling with delight. She wrapped that kitty to her chest and held tightly. She couldn’t stop hugging her kitty. It was HER kitty and it was back where it belonged! TheMonk, however, wasn’t so sure. He kept referring to it as “Swee’Pea’s new kitty.” (After all, it was spotless! No hint of drool or dirt anywhere.) I finally told him that it was, indeed, Swee’Pea’s old kitty but that Daddy had given it a really good bath. TheMonk grudgingly accepted this and all is now right in the house. Someday she’ll learn that this isn’t her original kitty but like a little boy almost 30 years ago, what she doesn’t know now certainly won’t hurt her. Swee’Pea with Kitty 1.0 at 20 months. Swee’Pea with Kitty 2.0 at 3 years 4 months. As you may know by now, I have started on the path to a healthier lifestyle by exercising on a regular basis. In the past 8 weeks, or so, I’ve lost about 6 pounds and a lot of my moobage. (I would have lost more weight but I’ve been lifting weights now too and the added muscle messes with my weight loss. So I now go by the mirror test. If I can stand to look at myself in the mirror, then I’m doing okay.) I can now run three miles pretty easily and I look pretty darn good with my shirt off. You’ll just have to trust me on that one. Lately, however, when I’ve been on the treadmill at the gym and I’m watching the calorie counter creep up to my goal 400+ calories burned, I start rationalizing things in my head. I’ll think, “If I stop running at 250 calories, then I can just eat less tomorrow and it’ll be a wash.” Then I start thinking about what I can cut out of my diet the next day that will help me reduce my caloric consumption enough so that I may step off the treadmill early in good conscience. The only thing that is off limits is my morning mocha. Moobs or no moobs, a guy needs his coffee. In fact, I have a new strategy. Since eating celery apparently burns more calories than it provides, if I go on a celery & mocha diet, I should still lose weight. I’m kinda surprised this isn’t being touted on late night TV as the next big thing. Maybe I should patent it. Oh well. First things first. I need to go get my mocha. And some celery. Nice to meet you… booty! I have learned the having three year old twins can be a great source of entertainment for me. For instance, did you know three-year-olds will pretty much repeat anything you teach them? It’s true. Of course, what’s entertaining for me, is not always entertaining for my beautiful wife. I mean, she has this crazy idea that we should be teaching them positive things. Like that’s any fun. For instance, lately TheMonk seems to be slowly leaving the 3T sized underwear and heading for 4T land. How I know this is that he’s been picking at the underwear wedged up into his posterior at regular intervals. And since I only buy underwear for myself every five or six years… He might be in this predicament for a while. What’s funny is hearing him say wedgie. What’s not so funny is me having to fix the wedgie. I guess my next lesson will be to teach that guy how to pick at his own wedgie. But I’m not the only one influencing his choice of words. This past week he came home and started saying at random times, out of the blue, “Nice to meet you… Booty!” This always produces a good belly laugh from TheMonk and even his sister has joined in. Lately, however, they’ve been upping the ante by substituting words for certain male and female genetalia or for certain bodily functions for the word “booty.” Let me tell you, it’s not pleasant to have to hear, “Nice to meet you… Poo Poo!” over and over again. So, we have told them we don’t talk about that in public. That it’s private and no one wants to hear about it. *Sigh* How do I even argue with that? This weekend, the lovely wife and I decided that our kids had been walled up in their cribs long enough. I’m not sure why we thought this. I mean, in the last 3.4 years they have made zero attempts to flee their pens. I surmise the reason for this is because they have each other and really have no incentive to make a break for it each morning. Or maybe they just like being locked up. At any rate, I’m not sure why we were so intent on opening the floodgates to freedom. I don’t even think heavy drinking was involved. Soon enough I had converted the beds and we called the kids in. When they saw the beds they were a tad excited. 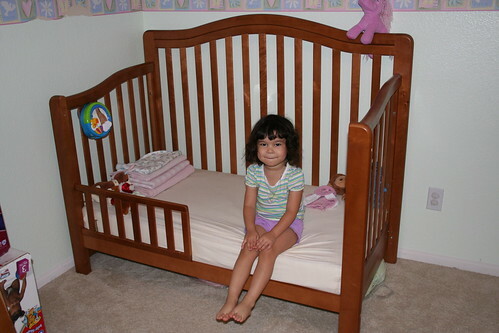 I think the technical terms is “went ape sh*t.” They started screaming “I got a big girl bed! I got a big boy bed!” and they immediately began to jump on the beds. This is when we let the air out of their balloons. We established some rules. As parents it is our job to make even the most exciting moments have rules. I’m sure one day the twins will get used to it. This is gonna last, right? Right? Swee’Pea and TheMonk come from a long line of talkers. Looking at my side of the family I can’t think of one person who would be the shy, quiet kid. Needless to say, family reunions are pretty loud. So it should be no surprise that our kids can be… a bit on the chatty side. Quiet moments in our household last exactly 1.2 seconds. The exact amount of time it takes to swallow food. Then, with nothing preventing them from spewing forth on every topic imaginable, they unleash words at a dizzying pace. 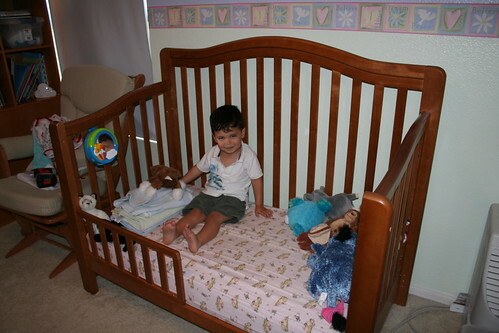 From the moment TheMonk wakes up and calls across to Swee’Pea in her crib, “Swee’Pea! Wake up! Listen to me!” the talking runs right up until they fall asleep at night. And this has become our problem as of late. You see, lately they have been blabbering away deep into the night. Sometimes they go as long as two hours of constant chattering back and forth. Giggles often follow the chattering followed by 1.2 seconds of silence only to have it start all over again. In an effort to control the blabber mouths we started outlining repercussions. We started by pledging to take away stories at the next night’s story time (which is usually quite effective). Unfortunately, we are old and senile and cannot remember 22 hours later what was threatened the night before and, inevitably, we’d forget about taking away stories. A few nights ago I decided a new punishment. If they didn’t go straight to sleep, they wouldn’t be able to watch Lazy Town the next morning. (This show has been their favorite lately and they will stare blankly at the screen with drool running down their mouths for 30 minutes each morning. Score!) The first night, they laughed at my authority. TheMonk continued to blabber deep into the night, mocking my punishment as the empty threat he knew it was. The second night, as we’re putting them to bed, I reminded them of the rules. If they talk, they can’t watch Lazy Town and we didn’t want to go another day without watching Lazy town, right?! They agreed to go to sleep. TheMonk, especially, vows to go right to sleep without any talking. He promises that he will comply with my request by doing absolutely no talking. None whatsoever. As I closed the door behind them, I listened for the inevitable talking. I walked down the hall and turned up the baby monitor to listen. And I heard nothing but silence. I smiled and thought about how once again I had conquered this parenting thing. This is frickin’ EASY! I laugh at all of you parents out there who talk about how hard it is to control your children! I AM DA MAN! But then, as I walked away, I heard a noise from the monitor. What was that noise? It wasn’t talking but I couldn’t quite make it out. I stood by and continued to listen. And then I got it. TheMonk was pretending to snore. I laughed out loud and realized that TheMonk was being true to his word. He was definitely NOT talking. Maybe this parenting thing is harder than I thought. All of a sudden, like in the blink of an eye, my little babies have become a little boy and girl. All of a sudden, I’m having real conversations – real give and take – with Swee’Pea and TheMonk. All of a sudden, I am reminding myself that my kids can do and say so much more than I think they should be doing right now. This began an earnest attempt to educate Swee’Pea and TheMonk about what to do if they are lost (We told them to go to the cash register – the place where they take the money.). We also began quizzing them on names. “What’s Mommy’s name?” we ask. 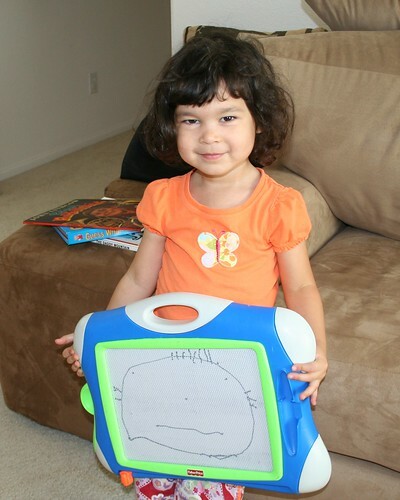 “What’s Mommy and Daddy’s name, Swee’Pea?” Mommy asks. We then go on to ask them their last name which they both know, but are a bit uncertain to say until we reaffirm that indeed, that is their last name. Finally, we ask them to tell us their full name. This is where the silly faces and ensuing laughs resumes. Oh? And I suppose Monk’s name is “Jelly?” I ask with a smile? TheMonk likes this and laughs out loud. Soon they are calling each other Banana and Jelly. This is funny to three year olds – and 37 year olds too. We all have a good laugh. I have written here a few times about my efforts to regain my girlish figure. For instance, lately I’ve cut back on the instant coffee to prevent the growth of more moobage. But over the past 6 to 8 weeks I’ve actually resorted to drastic measures to lose some weight. I know! What a novel concept, right? I have been hitting the gym three or four times a week. I usually do between 20 and 30 minutes of running on the treadmill and then do a light weight workout of squats, bench and shoulder press, lat pull-downs, hamstring curls and leg extensions, and abdominal and lower back exercises. I then collapse in a heap lay down on a stretching mat and force my body to become a tad more flexible than the tin man from the Wizard of Oz. Over the past month I have begun to notice changes in my physique. My waist line has been the biggest beneficiary as it has shrunk enough that I can now cinch the belt another notch. I have also welcomed back some muscles that I thought were long gone. My shoulders and chest are becoming a bit more manly and a bit less womanly and I can now make my pecs dance when looking at myself in the mirror. Which is, by the way, a great way to pass the time when you’re bored. I’ve been so good that I decided to reward myself by purchasing some newer exercise clothes. So I went to Target and bought a few shirts and a pair of shorts. Now I should tell you that I never try on clothes when I go shopping. I know my size so I just pull off what I want and pay for it. So when I grabbed the shirts, I didn’t even think twice about trying them on. Well, last night when I went to put on my new shirt to go exercise at the Y, I noticed that my shirt was a bit… um… tight. So tight that it left nothing to the imagination. And, since I’m still a work in progress, I was a bit concerned that my dancing pecs wouldn’t be enough to distract people from the slight pudge in my mid-section. But my wife, who has a great sense of humor and probably chuckled silently to herself all last night, persuaded me that I looked good. So, taking her word for it, I went off and exercised with the tightest shirt known to mankind. I survived. Turns out, dancing pecs do distract from pudgy midsections. Now, since I bought three of these shirts, I have to keep working on that midsection because dancing pecs can only take a guy so far. Washington, D.C. – In a surprise move today, leaders of both the House and the Senate proposed legislation that would allow the Federal Government to hold a yard sale to raise much-needed capital for the nation’s ailing financial sector. Standing on the steps of the Lincoln Memorial (which featured an orange sticker with the price tag of $1,000,000 plastered to Lincoln’s forehead), Speaker of the House Nancy Pelosi, House Republican Leader John Boehner, Senate Majority Leader Harry Reid and Senate Minority Leader Mitch McConnell, in a rare showing of bipartisanship, declared the need to sell off stuff the nation has laying around. “We have become a nation of hoarders and collectors and now is the time to break that habit while also raising much-needed funds to help bolster the confidence of the U.S. and World markets.” said, Pelosi. The Yard Sale will be held deep in the heart of Texas on Saturday from 8:00 a.m. to 5:00 p.m. Serious buyers will want to arrive early for a chance to purchase the high end merchandise. The Florida Marlins, however, should still be available for the late arriving crowd.